Not all of Benet’s bowling teams require an extra set of shoes. The Scholastic Bowl team meets every Friday to prepare for their competitions. A scholastic bowl competition involves two teams competing to answer questions about a wide variety of topics, from math to art. While there are sometimes games for freshmen and newcomers to become accustomed to the club, all age levels typically compete together. Competitions are a series of toss-up and bonus questions; the team who answers the toss-up question correctly is able to answer the bonus questions, which are often related to the toss-up question. The members of Scholastic Bowl go over this format during practices, when they split into teams and compete against each other for practice. 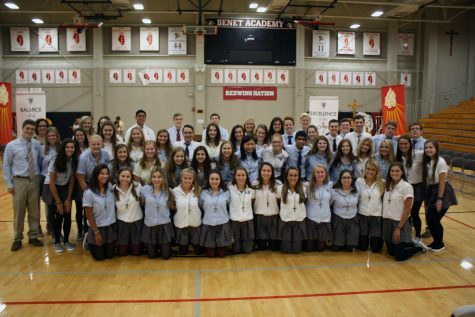 Benet’s team kicked off their season on a high note in November, when they won seven of their eight matchups at the 2018 David L. Riley Kick-Off Scholastic Bowl Tournament. They will look to keep up their momentum as the year progresses. These meetings are run by Scholastic Bowl’s teacher moderator, Mrs. Laura Dovalovsky, and seniors Adeline Collins and Bernadette Miao. Good luck to the Scholastic Bowl team at their next competition!